Yesterday, the Department of Justice announced it is considering criminal charges against BP. This is a critical moment for us to demonstrate the public demand for a Crude Awakening and hold BP accountable for their crimes against the families in the Gulf. Time to take to the streets! Another action alert for Maryland residents. We need Metro. I know I need Metro! Below is an e-mail from the Coalition for Smarter Growth on this issue. Contact Governor O’Malley! Time is running out – Metro service cuts may soon be a reality. We need your help to stop these drastic cuts. Send an email to Governor O’Malley urging him to prevent these devastating cuts. Metro is a basic and essential service for the region’s economy. Metro will make its budget decision soon. Emails will also automatically be sent to the Metro board. Polls show a clear majority of residents support more funding for Metro. Email Governor O’Malley today and urge them to listen to us and help save Metro service before it’s too late. The State of Maryland is saying they can’t afford to provide its share of the additional funding necessary to prevent drastic cuts in service. It is the joint responsibility of Metro jurisdiction governments – Maryland, D.C., Fairfax, Arlington and Alexandria – to collaboratively fund Metro. Metro is the region’s transit service that takes hundreds of thousands of area residents to and from their jobs, stores, appointments and school every day. We ask that the State of Maryland and all the member jurisdictions fulfill their responsibility to the region’s residents. More Traffic, Longer Commutes, Lost Jobs? The cuts that Metro is facing – detailed here – would not just be inconvenient, they would be devastating. Cuts will damage the economy, hurt local businesses, cause job losses (how will people 100% dependent on transit get to work? ), increase traffic and discourage transit-oriented development, which has been key to revitalizing D.C. and the inner suburbs. Just Monday, the Washington Post released a poll showing that a clear majority of area residents support new funding sources for Metro. Eighty percent of Metrorail riders rate the system as good or excellent. Sixty-two percent said that efforts to reduce traffic congestion should focus on public transportation. It’s time for Governor O’Malley and all area government leaders to step up to the plate and preserve the system they have already built and over a million riders depend on every day. We’ve already submitted more than 2,000 petition signatures and 1,200 emails to leaders in Maryland, D.C., and Virginia, but we need more to get their attention. Please email Governor O’Malley one more time. We recognize that all governments are strapped for money, but letting Metro service fall to below minimal levels – on top of charging riders higher fares – makes no sense. We need true leadership from Maryland, D.C., and Virginia in these challenging times. Instead of abandoning the system that we spent billions of dollars to create, we need to maintain it. Email Governor O’Malley today and remind him that Metro is still the best and safest ride around. Tell him what Metro means to you and ask for his leadership in supporting the necessary funding for Metro. Thank you for your passionate support of our Metro system! This is a cross-post from the Anacostia Watershed Society’s website about the stormwater showdown happening right now in Annapolis. I blogged about the lousy compromise the Maryland House passed. It’s up to the Senate to say no and ensure Maryland Dept of Environment enforces the existing law. This past Friday, March 26, 127 Maryland state delegates took a vote that is bad for the Anacostia and bad for the Bay when they passed the Holmes bill, HB1125. In the rush to get the bill to pass the House of Delegates, the potential impact on clean water was greatly understated. AWS is working with a number of partners to counter the misinformation so that the Senate does not make the same mistake as the House. The bottom line is that the bill undermines key protections for our waterways and therefore should not be passed. Please, if you live in Maryland the time to speak out for the Anacostia is now. Please take a moment to send an email to your Senator, and copy the chair of the Senate environment committee, Joan Carter Conway, and the Senate President Mike Miller. There are four Senators on the Senate environment committee that represent Anacostia districts. Each of them have been strong advocates for clean water, but the pressure to let the bill will be intense. If someone else is your Senator, write these four and tell them that you stand with them as a citizen of the Anacostia and an advocate for clean water. We need to make it clear that there is a large constituency for clean water in Maryland! If someone else is your Senator, write these four as a citizen of the Anacostia and ask them to stand up for our river. Also CC: these Senate leaders to make clear to them that there is widespread opposition to HB1125. The standards proposed under the 2007 Act are fair and the existing regulations provide developers with adequate guidance. There is no need to make concessions. We have asked many sectors of the economy to pitch in for clean water – industry, agriculture, and wastewater treatment. It is the developers’ turn to do their part. If they continue building without adequate controls taxpayers will continue to bear the burden of damaged infrastructure, polluted waterways, and reduced fishing and tourism. The 2007 Stormwater Management Act was passed with broad support in the General Assembly and among the development community. For three years the developers have known what is coming, so crying that the sky is falling at the eleventh hour is disingenuous at best. What has changed in the past three years that the House of Delegates would reverse itself so completely? The development community is facing hard times because of the larger economic conditions, not because of stormwater standards. The best time to get a handle on polluted runoff was 20 years ago. The second best time is now. If not now, when? I’ve been getting e-mails from different environmental organizations for over a week pushing for the passage of climate legislation in Congress. I don’t know the total between all of them, and it’s likely some callers verified their call with more than one organization, but just the numbers I’m seeing from Repower America are incredible. Here’s the opening of an e-mail they sent to me. Keep up the good work guys! Oh, and if you haven’t, call your Senator. **Update** : I’m now hearing over 300,000 calls were made between all environmental groups! We don’t put all of our money down at once when buying a home; we take out a mortgage and pay it off during a long period of time. Our cars are bought in monthly payments. Even the total cost of college tuition is broken up during the course of four years into a bill each semester, and that’s assuming there wasn’t a student loan to start. Can you imagine how much harder it would be to buy houses and cars or go to college if you had to pay all of the money from the start? This scenario was so frightening in 2008, we threw more than a trillion dollars at our banks and mortgage companies to try and keep them lending. Yet, take a look at how Americans pay for clean energy technologies and energy efficiency upgrades. We treat this market the exact opposite way, where the cost to put solar panels on a house or upgrade the insulation is paid up front. To compensate for this, governments have offered clean energy and energy efficiency tax credits to try to offset some of that upfront cost. These are nice, but usually aren’t enough to make a difference. To a middle-class family, it doesn’t matter whether a solar installation costs $20,000 or more. Paying all of it upfront just isn’t financially reasonable. We don’t even do this for other forms of energy. For coal or natural gas, the energy company pays for the capital costs and the cost of producing the energy. We pay the electric bill monthly. Can you imagine how ridiculous it would be if as you were moving into your house, you paid your energy company the estimated total cost of 15 years’ worth of power right at the start? The issue with clean energy might have been cost three decades ago, but now it’s financing, and we’re lousy at it. Fortunately, 16 states around the country have enabled their local governments to adopt an innovative kind of financing model for energy efficiency and renewable energy projects, called Property Assessed Clean Energy. Here, municipalities establish loan funds to give citizens full financing for substantial energy efficiency and renewable energy improvements on their property. The costs of the improvements are paid back on the person’s property taxes over a period up to 20 years. Although PACE is new and only a few local governments have adopted it, the results have been incredible. For example, Boulder County, Colo., was one of the first movers, and in only the programs first phase, $6 million worth of loans for clean energy and efficiency went out, funding hundreds of projects and creating jobs. The Maryland Clean Energy Center was created by our state government to work on developing and deploying clean technologies in the state. One of the first programs they’re offering to assist in implementation, financing and administration is the PACE model for local governments. All municipalities in the state need is legislation from Annapolis enabling them to move forward, like what has already happened in 16 states. HB 1014 and SB 720 in the Maryland General Assembly will do just that. I implore you to call your state representatives and ask them to support it. A few months ago, I wrote a column about the hypocrisy of the Obama Administration in moving towards a deal with Canada were we import oil from their tar sands. This form of producing oil i ts about as dirty as it gets. Secretary of State Hilary Clinton is now faced with the decision of signing off on an oil pipeline between the two countries that would the transport the tar sands oil to the US. 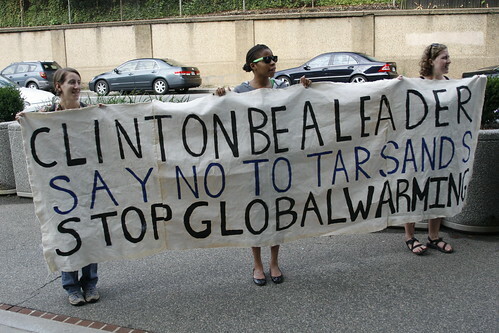 Some youth activists staged a protest outside of the State Department calling on Secretary Clinton to deny the pipeline. Now obviously this decision rests in the President, but Clinton’s opinion goes a long way. I’d suggest reading more about it from the link above, but below are actions they have listed which you can take to affect this decision. In case you’re within striking distance of DC, and you want clean energy and climate change legislation. If you aren’t call your Congressman. ACES Floor Vote Mobilization @ 1PM Friday! TAKE ACTION TOMORROW ON CAPITOL HILL! We Need More—Pass a STRONG Climate Bill! At 1 PM Friday, we’re rallying together on the hill across from the Cannon House building. We’re going to pack the galleries, and make our demands visible on every street corner! This is it – the big vote. The House of Representatives is deciding whether to vote yes or no on the ACES climate bill, and where are we going to be? Right in the middle of this debate. There will be giant green hard hats, wind turbines and more! The more people we have there, the bigger impact we can make. After the brief convergence we will be marching around the capitol with our big visual pieces. 2PM-? : Flood the Halls: Can you stick around for more? After the rally and march we will be flooding the house office buildings and the galleries in the house chamber with citizens in green shirts and hard hats. Stay as long as you can. It’s important that the members see us and hear our message before they go to vote. We Need More than this ACES bill, and We Need You to join with us tomorrow so this message is heard loud and clear. If you have to take off work to be there, we urge you to do so. Come out for the whole day if you can, or meet us at 1pm for the convergence. How can you help us do it?